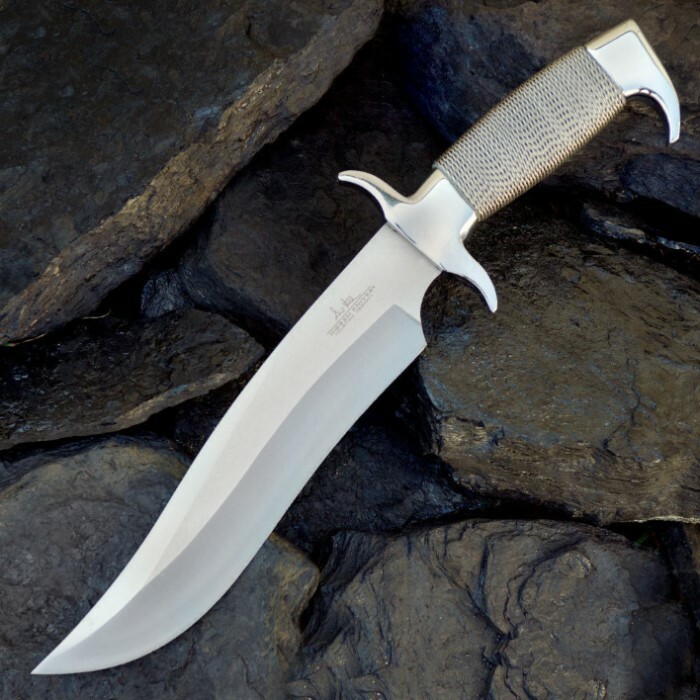 This Gil Hibben classic masterpiece was designed with the ancient Scottish Highlanders in mind. 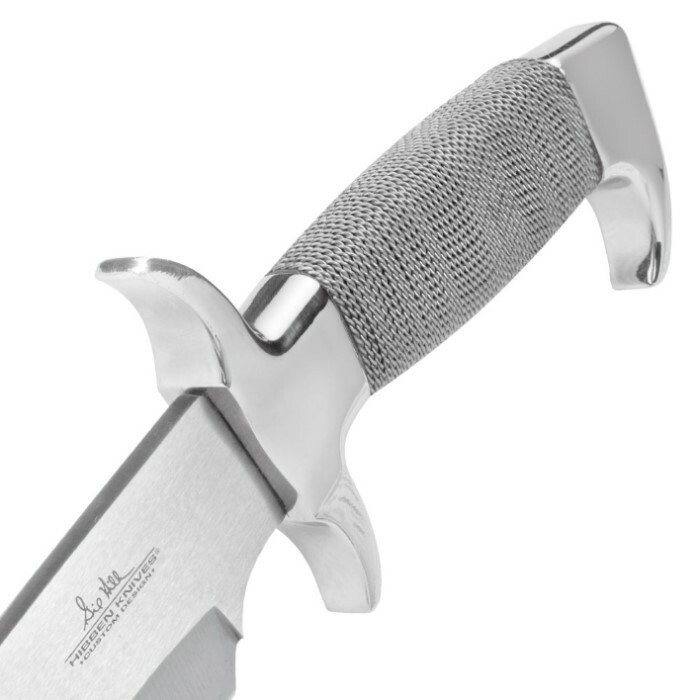 It has a razor sharp 8 3/4" 420 stainless steel blade and a stainless steel wire-wrapped handle. It also features a mirror polished stainless steel guard and pommel. A leather belt sheath with a snap closure is included to house the blade. 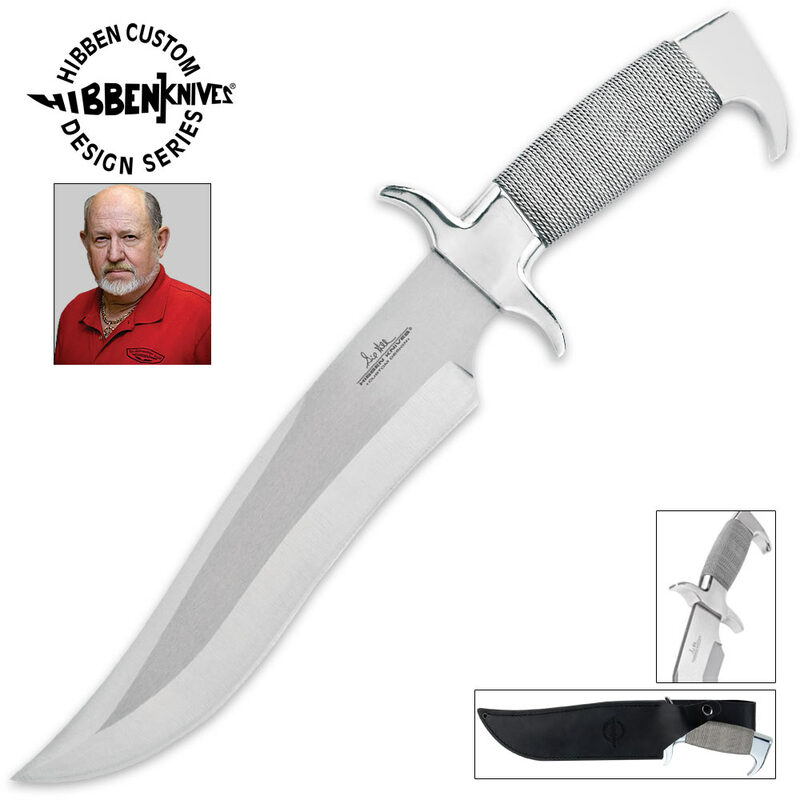 Add the Gil Hibben Highlander to your collection today! I love it! I wanted a bowie that was big but not as big as a new age bowie of today. I have a few new age bowie's that really are small machetes. Anything 16 inch and above is truthfully a small machete. This is perfect size and is truly a beautiful looking knife. Great price too! The truly beautiful knife. looks good, feels good, and it cuts beautifully. the only minor quibble is the wire wrapped handle is not very suitable for being out in the woods with, other than that, superb! I bought this as a gift for a cousin. He spent the rest of the night with it on his hip or in his hand just staring at it. He came back over the next day and was still wearing it. It's a fabulously crafted beast. Gil Hibben/United Cutlery do it again! Props to Gil Hibben and United Cutlery on this beautiful but very functional work of art. At first I wasn't sure what I thought of the wire wrapped look, but it actually feels great in the hand, not so smooth and shiny (even though it is) that it'll slip from your grip and it looks very cool. The blade is a perfect length for a bowie, it's got nice heft and I have no doubt it'll skin what you want to skin and then clean up nicely to hang on your side again. Can't comment on the longevity of the edge on the blade but it'll be great to harvest enough buck to bring it to the grind stone every season. The only negative I have on this knife is NOT about the knife itself but as others have mentioned, the snap on the sheath won't snap because it's too tight over the guard that the first time you try and snap it the snap opens too loose for the grommet,that it'll never snap again, even if you do get the knife jammed in the sheath enough to give the snap a little room, it still won't close because it will be weakened from trying to snap it. Not really ideal when you're out in the woods relying a great deal on the knife, you may reach for it only to grab air because it fell out of a faulty sheath. Otherwise, I love the knife. Gonna get a similar Gil Hibben collectible next! Awesome knife delivered in awesome condition. Sharp, clean, and high quality. Out of the package is just awesome! This is the first Gil Hibben for me and I will not stop here. The knife is a good weight and was sharp out of the box. Have not had a chance too but I'm sure it can take some abuse camping and messing around the campfire. I love the polished look that the handle and guard have. Worth the $$. The only problem with mine is the button on the sheath does not reach around the snap closed...but who cares its an amazing Bowie! I've had this Hibben fantasy blade for 20 yrs. and I love it as much now as then. The first runs had a silver wire wound grip instead of stainless but that aside it is still a beautiful knife. I quit counting the offers I've had for it over the years as I have no intention of parting with it. The look and feel is exceptional and the budk price is excellent.